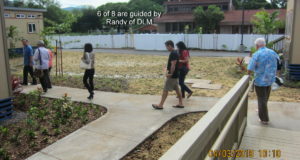 Yesterday we headed off to OGG for an early flight to peruse four different sites around the island of Oahu to see if what seems to be working to various degrees over there can be applied here on Maui Island. County Council member Kelly King organized the trip as plans for non-governmental involvement began last year with community meetings in September and October. 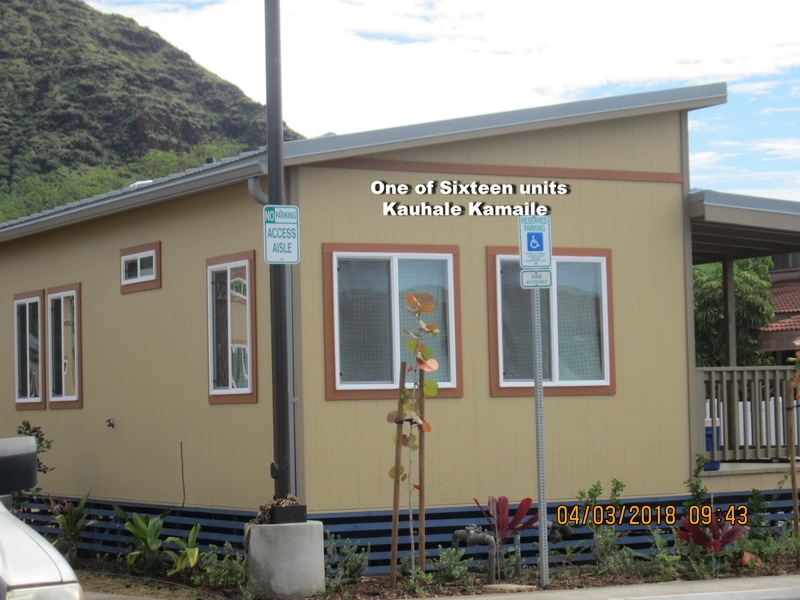 So a group of eight assembled at our airport with a plan to first explore Kauhale Kamaile in Waianae, a modular housing project just for families. 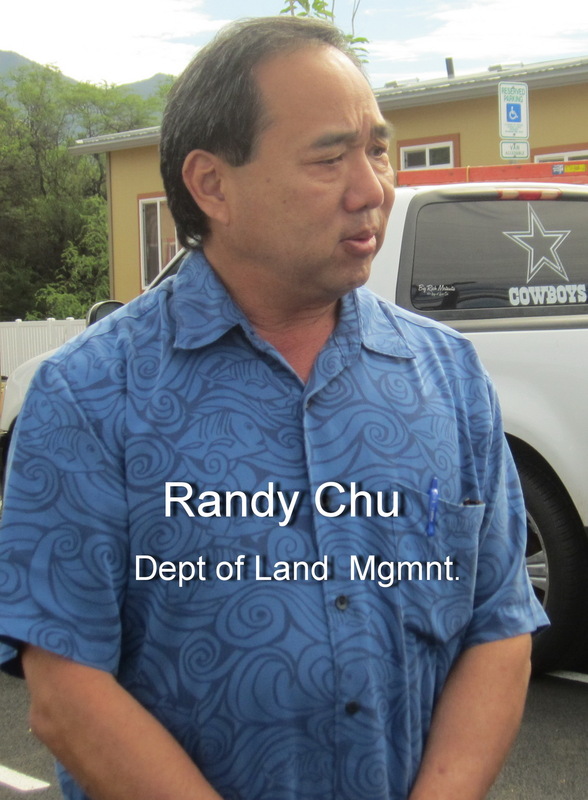 We were hosted by Randy Chu of the Department of Land Management at the Waianae facility. 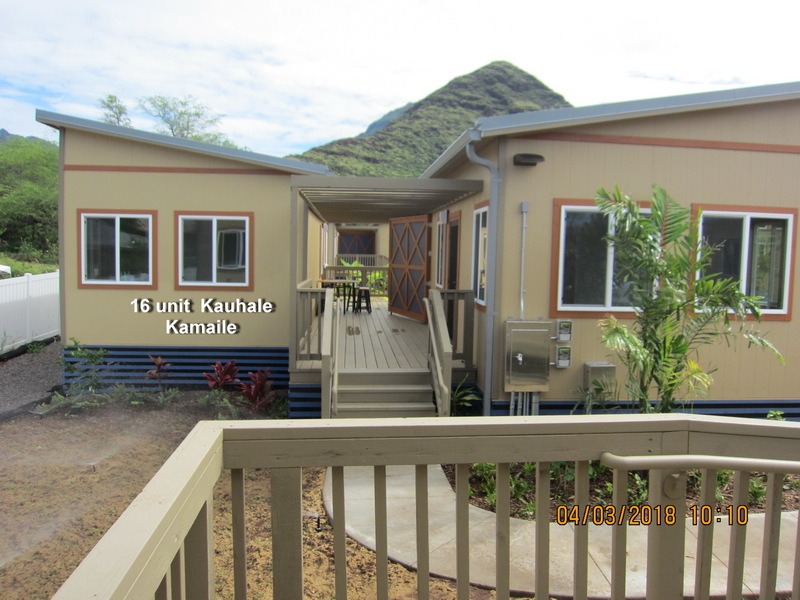 The 16 unit facility of 1, 2, & 3 bedroom homes on about a single acre of land which the city purchased for $300K recently just opened last month and currently has the first three families settling in place. 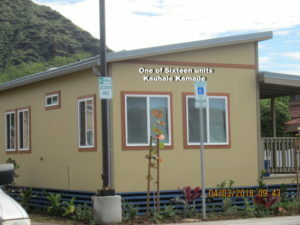 The rent runs between $900 to a bit over $ 1K per month, including utilities under the property management of ASI of Honolulu. 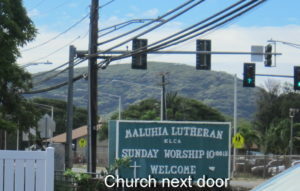 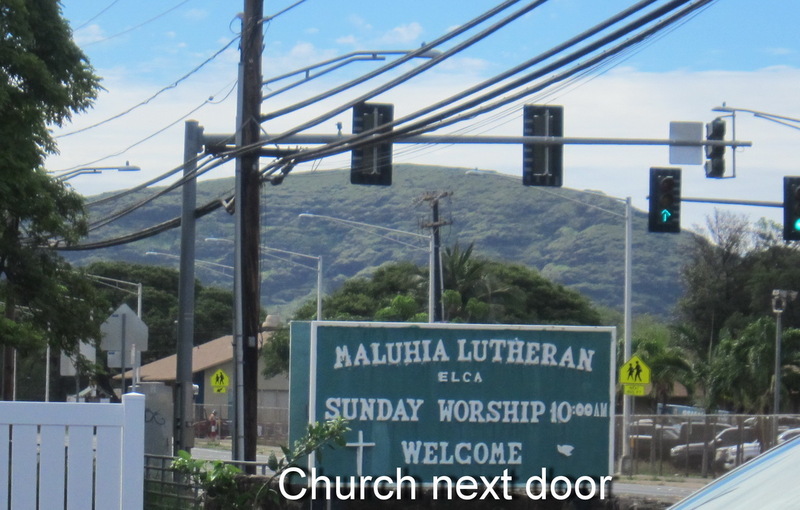 The site sits right on a bus line, is literally across the street from Waianae High School and next door to a local church which was extremely supportive of the project, according to Randy, and a short walk to an elementary school. 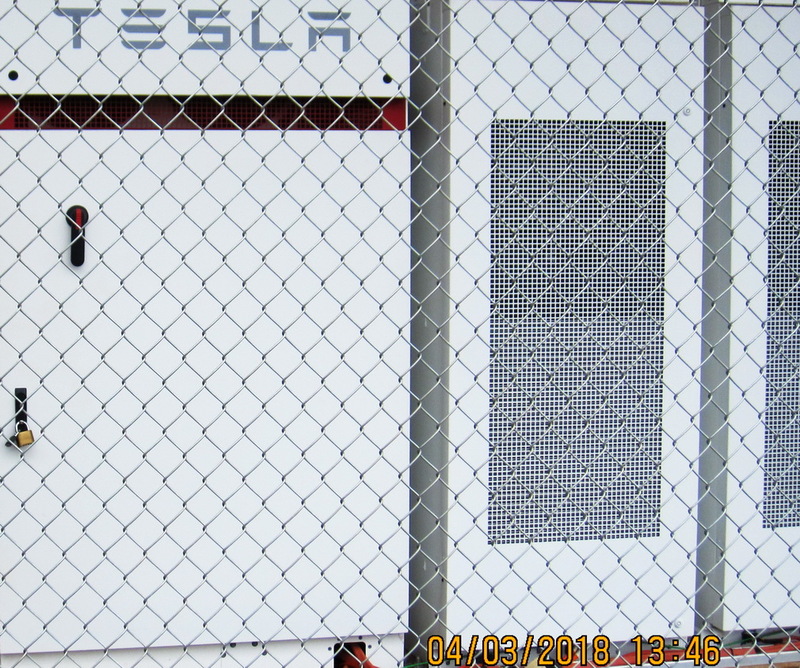 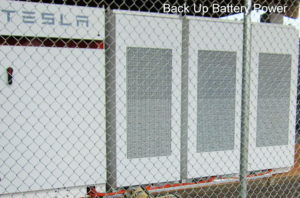 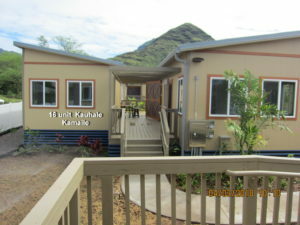 The modular units were shipping into to Hawaii intact, including the appliances, and then just set into place, after all the infrastructure had been constructed. 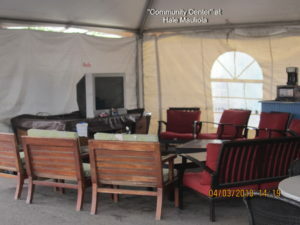 We found them to be very compact and utilitarian, but there were adjoining lanais creating a community feel. 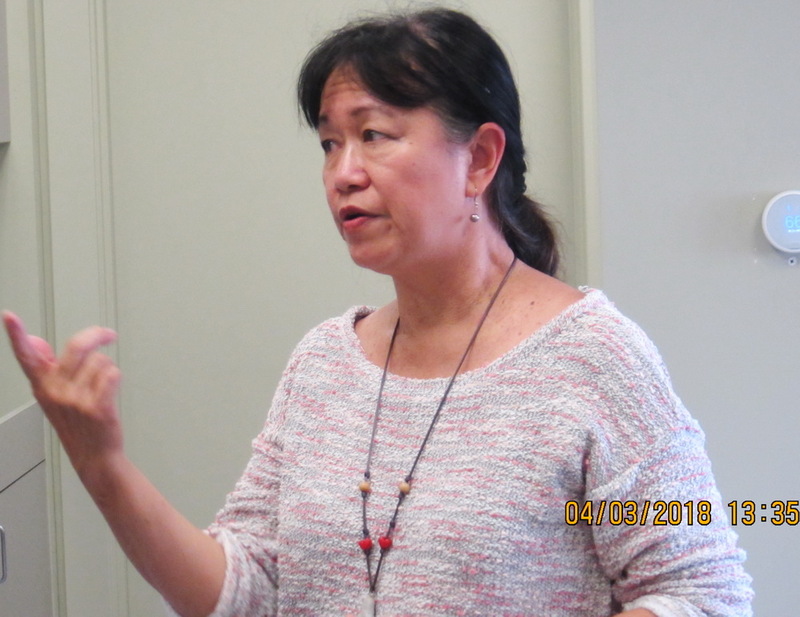 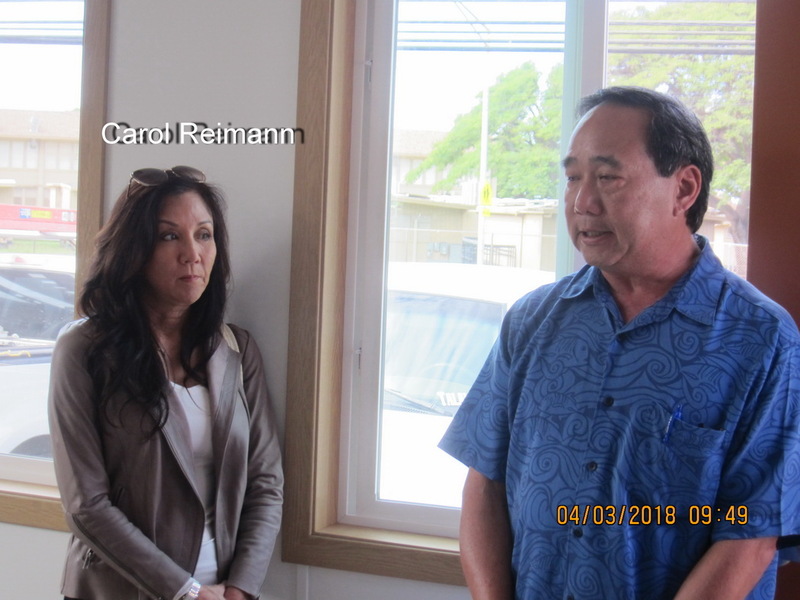 Our group included, in addition to South Maui Council rep King, her executive assistant – another Kihei resident – Susan Foley, Ka Hale A Ke Ola homeless resource center’s executive director Monique Yamashita and Housing program director Joy Rucker. 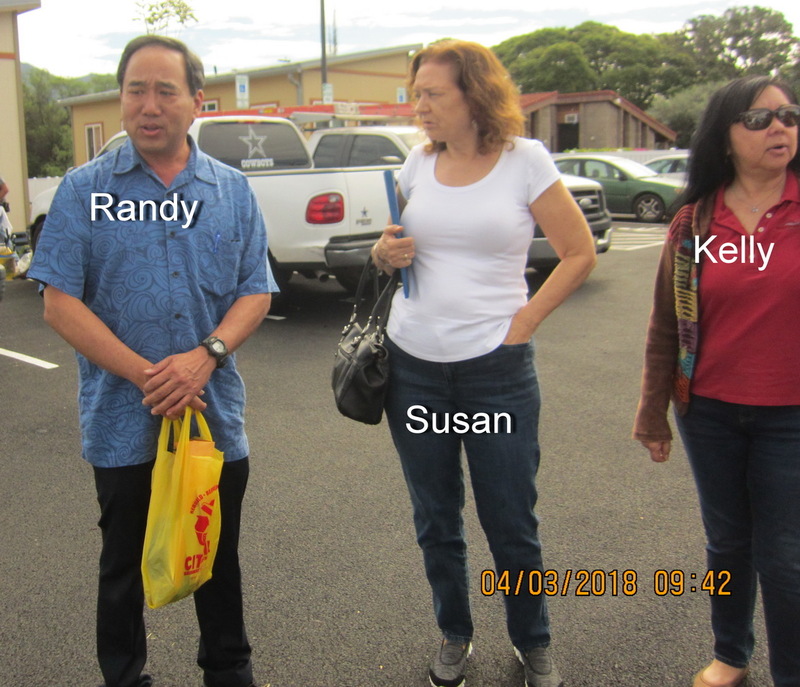 These four wahine were joined by Maui County Housing and Human Resources Director Carol Reimann, FACE Maui Chairman Stan Franco, “free agent” Eric Alberti – a Kihei resident very involved with the homeless issue, and KCA. 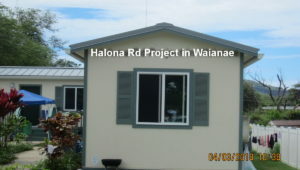 Our next stop with Randy was “Halona Road Project,” an 18 month old three unit project a few miles from Kauhale Kamaile with similar rents. 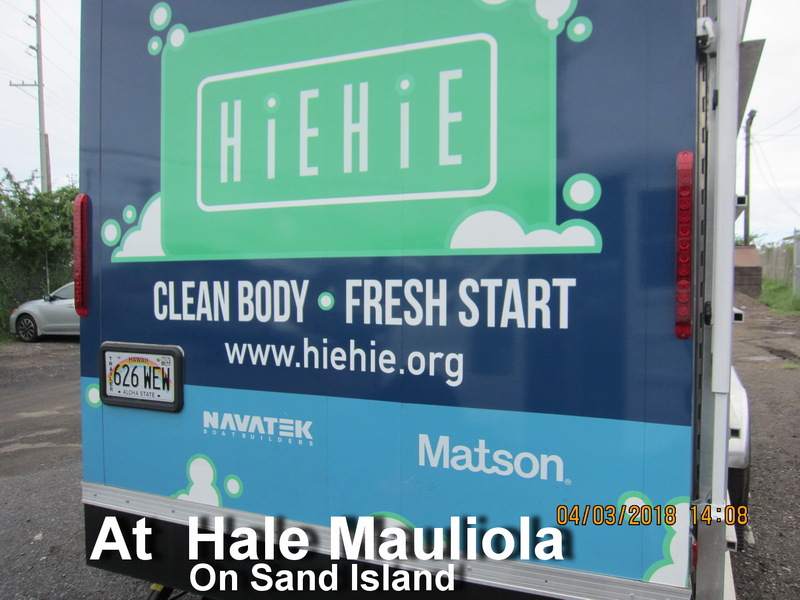 In the afternoon it was on to the Institute of Human Services (IHS) https://ihshawaii.org/# Kahauiki Village and later the Hale Mauliola on Sand Island. 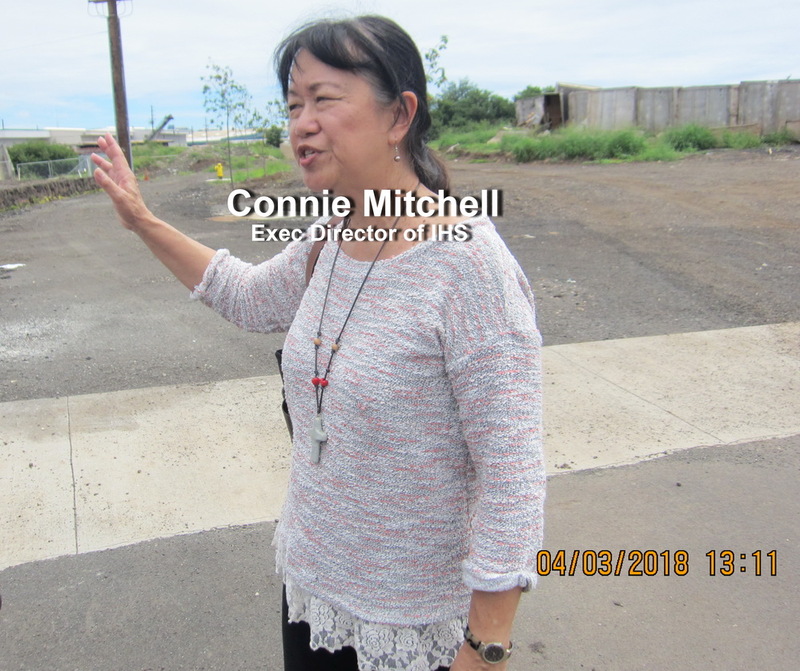 We met Connie Mitchell, the executive director of IHS, who explained her function was social support at the non profit organization and the habitats they created. 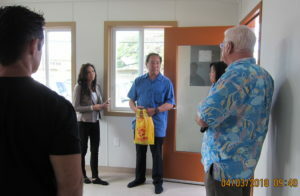 We observed she was very well liked and respected by both those living and working at this modular home location, consisting of thirty one- and two-bedroom homes in this first phase of the project. These modular homes were originally built after the nuclear disaster at Fukushima, Japan, and as their need there diminished, they were shipped to Hawaii for this project. 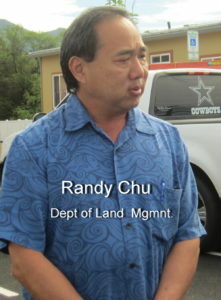 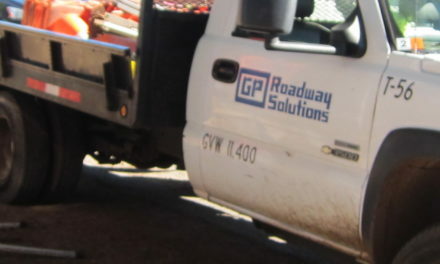 The project began with the city installing the infrastructure on this state owned land, and while it remains connected to utilities, except for county water it is completely sustainable and off the grid! 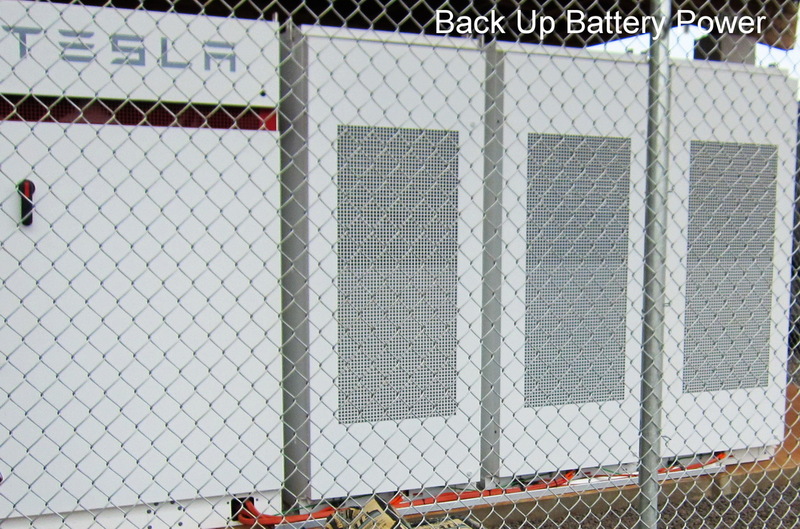 This was achieved by installing photovoltaic panels atop each imported modular structure and setting up huge storage batteries, so day to day electrical needs are satisfied internally. All the stoves are gas, as are the centrally located clothes dryers, and there is no air conditioning. 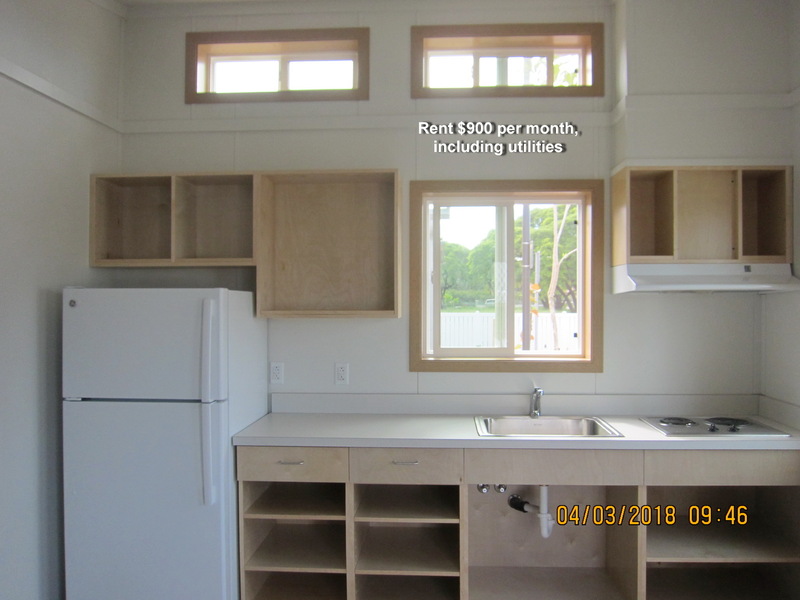 Rents for the one and two bedroom units run between $750 and $900 per month. 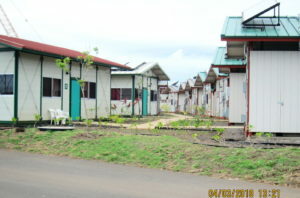 A requirement for living in the facility is employment. 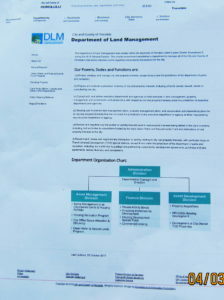 The next move is expansion into future phases as the overall plan calls for four more segments on this plot of land. 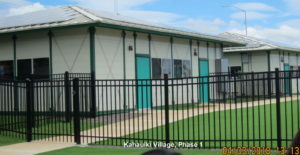 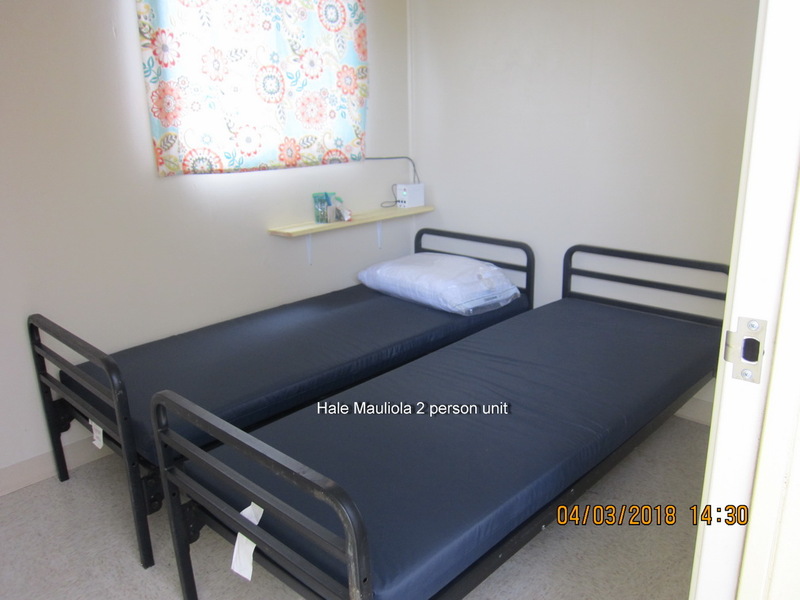 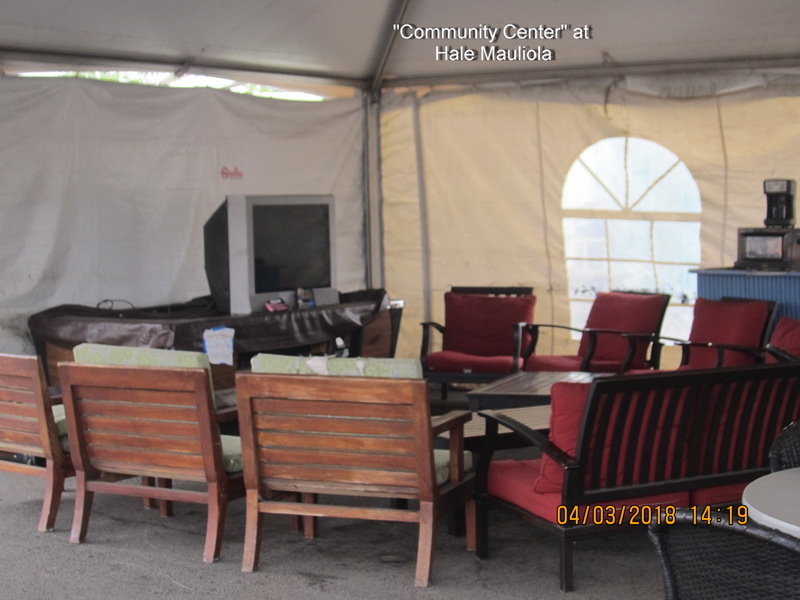 We then moved out further on Sand Island to our last project for the day, Hale Mauliola emergency shelter. Obviously this was a change from the prior three modular housing projects we explored in numerous ways, starting with its function as an emergency shelter for adults only, as opposed to family homes, to minimalist shelters, converting modified ship cargo containers, basically to be used as a safe secure overnight place to sleep. Each unit is set up simply for one or two adults, but pets are allowed. 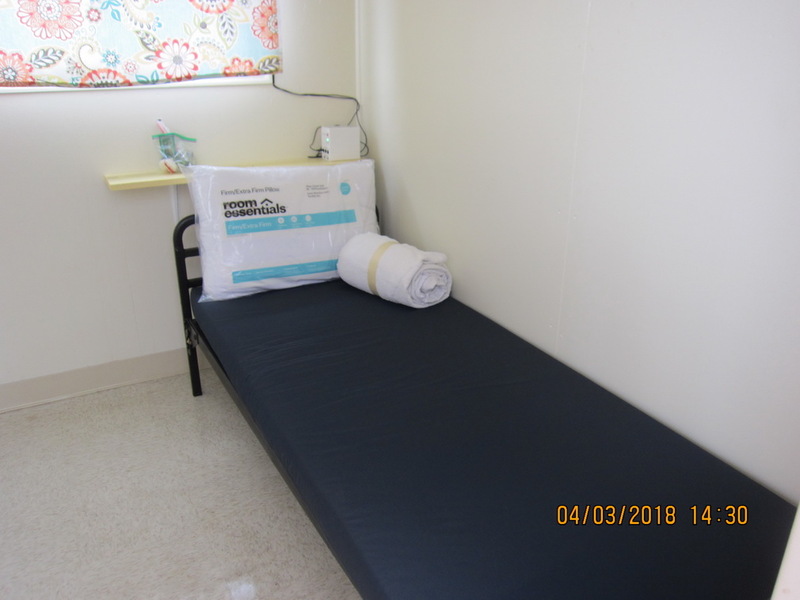 They were created about three years ago to offer security for individuals to move off the street and prepare them to move on when they can. 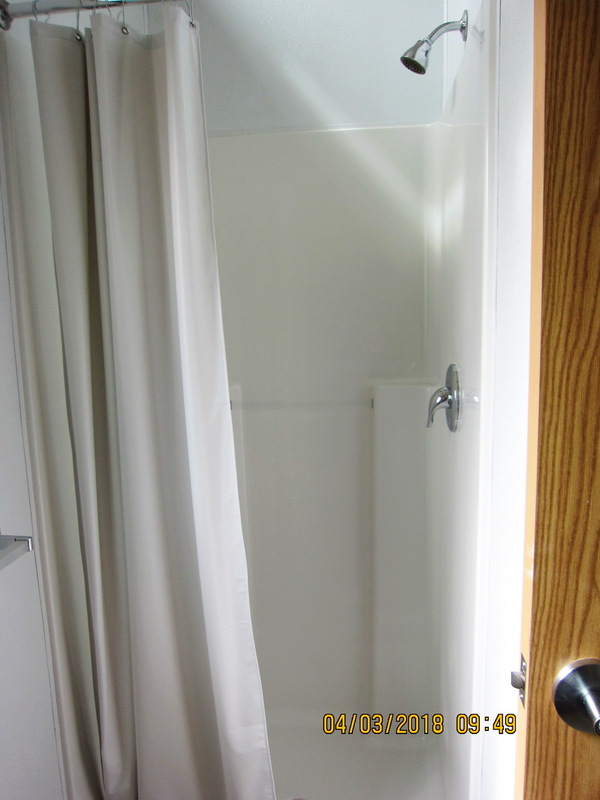 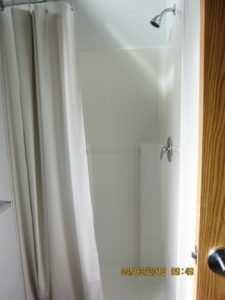 Sanitation is provided in portable trailer-like units for both toilets and showers. 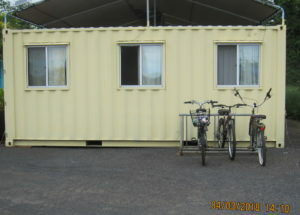 One segment of those is provided by Hiehie, www.hiehie.org. 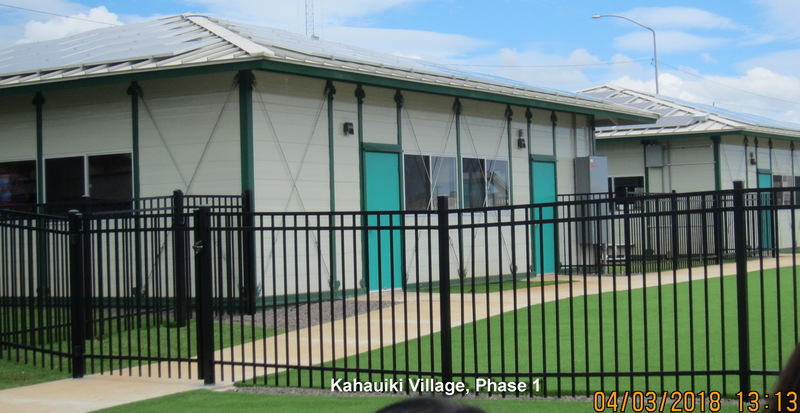 They park a shower trailer overnight at the edge of this project which is available to the residents to use first thing each morning before it goes around the island to be available at selected locations where homeless people may utilize it. 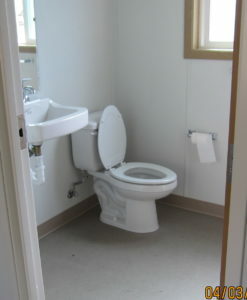 To be clear this was not a government sponsored junket. 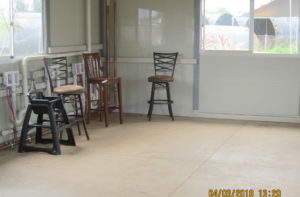 Each organization or individual was responsible to purchase airline tickets to participate, an indication of commitment. 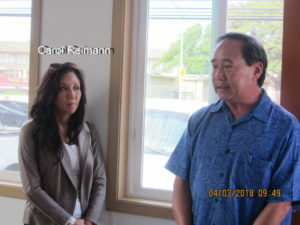 Making the financial commitment, while dedicating a long day in an effort to address what may be our island’s top need indicated true community concern. For KCA we did not find any silver bullet, but did truly appreciate that both local government and non profits were taking actions and presented outside the box thinking in finding solutions. 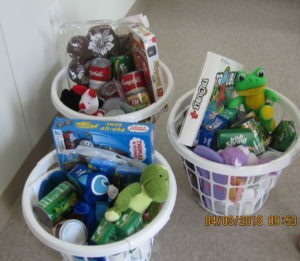 Yes: build something using creative thinking. 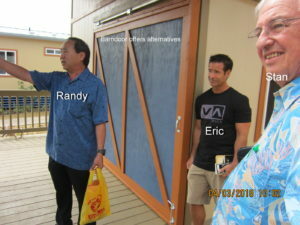 Right in north Kihei we see two mainland developers seemingly finding ways to build truly affordable 100% rental developments without any “market rate” ones to balance them financially. It can be achieved. 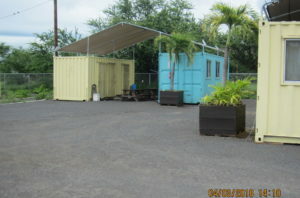 PreviousWho Says South Maui Does Not Turn Out at Public Meetings? 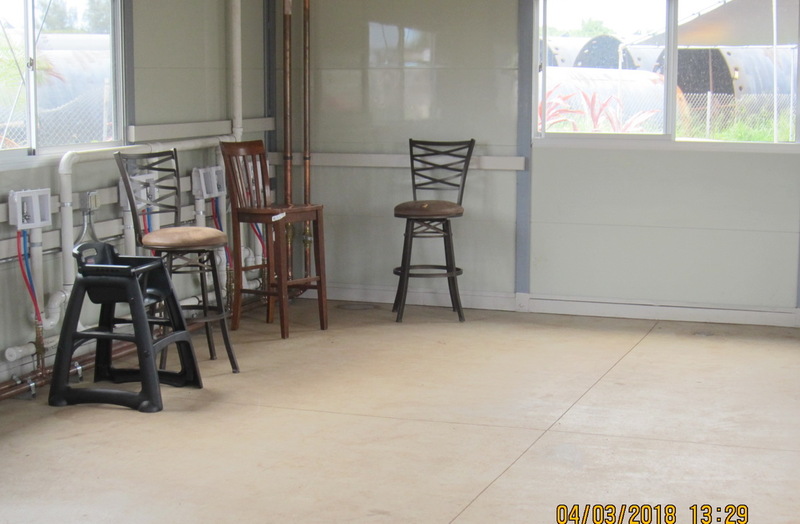 No one did on evening of March 29 for County Budget! 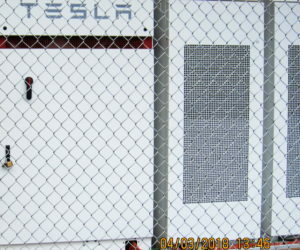 Great write up and descriptions. 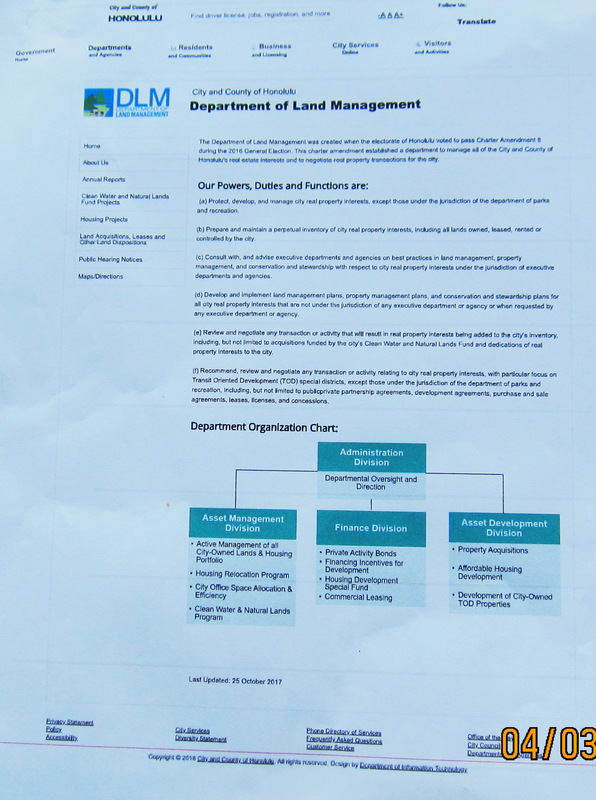 Some eye opening projects, experiences and potential solutions that our island can hopefully learn from. With so much respect we say mahalo to all of you who travelled and pursued this on your own time and dime.